*The item in this post were gifted by Candle Pin Club, but all opinions are 100% truthful and honest. You can read my full disclaimer policy here. 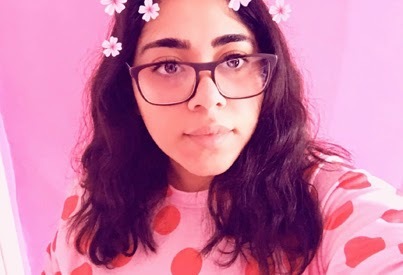 I was always that child who would run towards the cereal aisle and tightly wrap her arms firmly around any box that was overly coated in sugar or chocolate, but also included a free gift. I couldn't have been the only one who couldn't wait to get home just to empty and rummage around the box to find what's contained inside that tiny plastic packet. Sadly, it was never as fun as I'd imagined, but at least it leads me to become an overactive 7 year-old with an over-excessive quantity of E-numbers. What if I told you that you could feel the exact amount of joy, but with a candle? Not only could you burn a candle that will fill your entire room with the most delicious of scents, but you also receive something hidden inside the wax? Something that is definitely fun this time though. 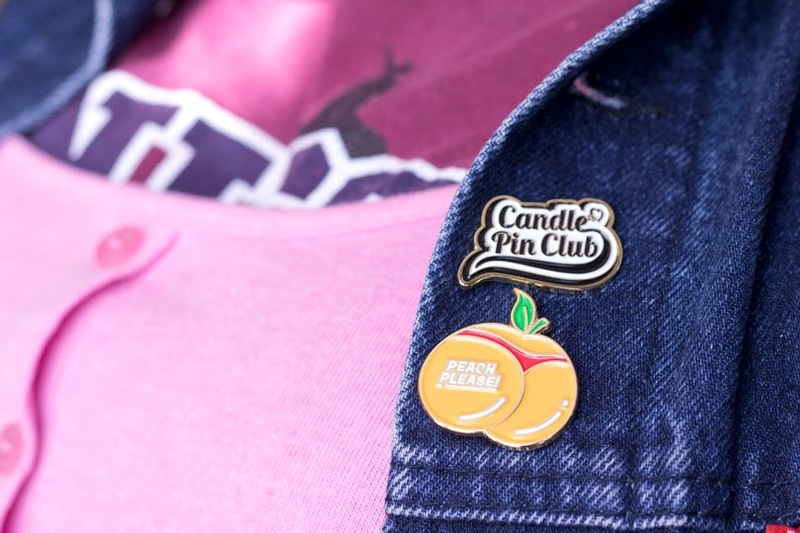 Candle Pin Club is the original candle pin club helping to encourage a great body image, happiness, and a fun and positive outlook on the world with their contemporary design and bold slogans. 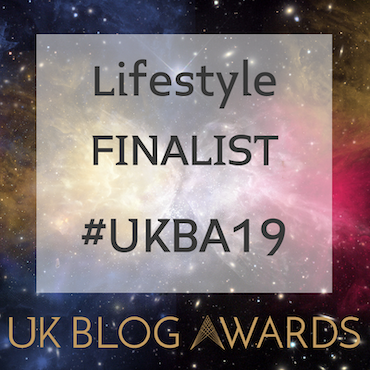 Each candle is vegan, made with 100% natural soy wax, handmade and hand poured in the UK. Only the best premium oils are used to create a highly fragrant and beautiful scent. Buried inside your waxed candle is an original enamel pin designed exclusively by the in-house team. The candles come in 12 different scents, from Sugar and Spice to Candy to Sea Salt. I was sent the Peach Please candle, (which I definitely think was a sign because of Peachpuff, but you know what I'm like with fate and destiny). 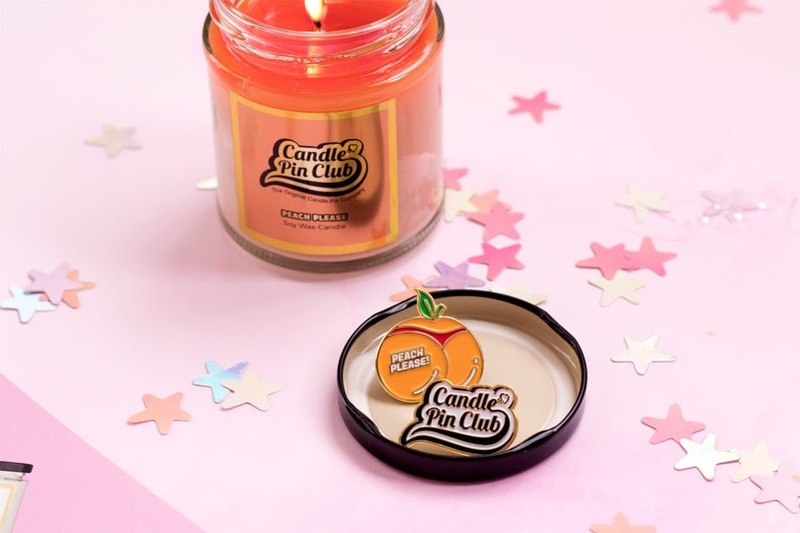 I have tried and smelt a whole bunch of candles in my time, and sometimes the fruit inspired fragrances can smell a little artificial, overly sweet or overpowering, but the peach scent in this candle is as real as it could be. It smells so natural and fresh - as if a peach has just been cut and place inside the jar. The fragrance is described as having 'top notes of juicy fresh peach and ripe nectarine with a luxuriant musky floral base'. The scent is just as refreshing while it burns too, which can sometimes be a concern when buying a new brand of candle. There is nothing worse than buying a candle that doesn't smell once you light it! Peach Please filled my entire room, (and through most of the house too), with its delicate scent. And luckily, each candle burns for 40 hours. Part of me wants to save it till the summer, the other part of me wants to use it now just to get me through spring... I wonder which option I've opted for?
. 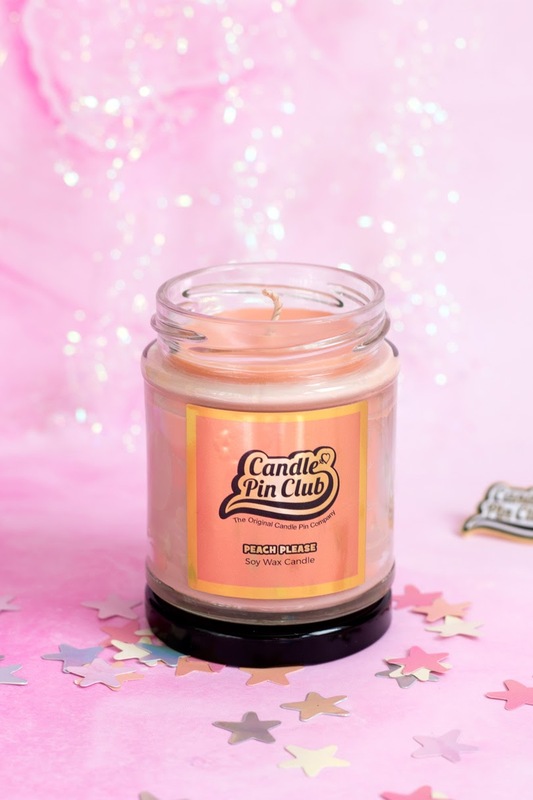 @helloaycan is talking about her brand new @candlepinclub candle! The candles come hand poured in a glass jar with a metal lid, and I always love to reuse my candle jars. I've previously used the larger jars to store fresh flowers or plants, and small jars for pens, pencils or stationary. My Candle Pin Club candle jar is giving me a water container for painting kinda vibe. Leave me a comment below and let me know how you like to reuse your candle jars. I'm sure I can guess what you all want to know right now. Where is the pin? All you have to do is light your candle and let it burn for around 3 hours. (I say 'all you have to do', I literally went to check every 2-3 minutes.) What you're looking out for is a gold shiny foil packet. Once it looks like it has burnt down enough for you to pull it out, blow the candle out, and using a pair of tweezers, pull the foil out and leave it to cool. Unwrap the foil, clean away any wax from your pin, and you're ready to showcase your brand new enamel. Each pin comes with a specific candle, making it very easy to collect them all. 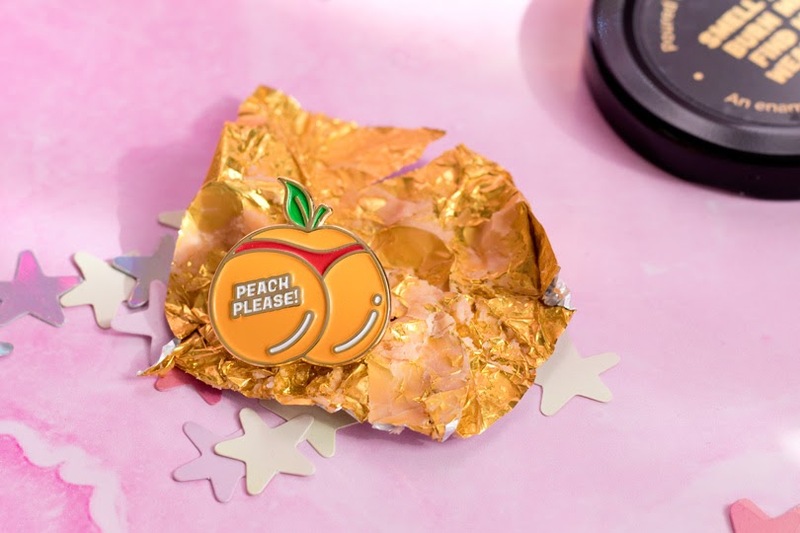 My pin is a very peachy bum, with the term 'Peach Please', which has now found it's home on my denim jacket. I absolutely love how original this idea is - you would never expect to find something hidden inside your candle. 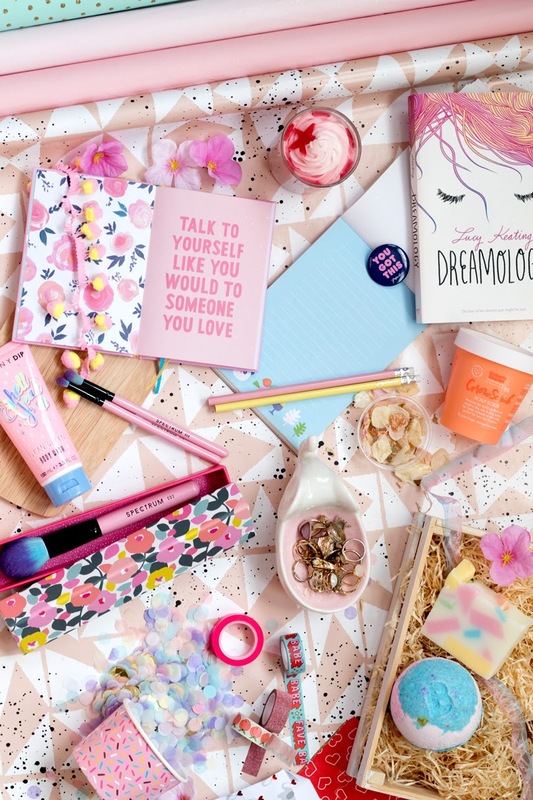 I adore any company who promotes positivity and a happier lifestyle and doing so in such a fun and creative way gets all the ticks from me. Even though I have only smelt one candle, with how impressed I am with it, I can only imagine how amazing the other 11 smell. I think Thank You may be the next on my list; it's a blend of lavender, rich coconut milk, and French vanilla. How relaxing does that sound? That would be my evening candle, while I bury my nose deep into a book. These also make a great gift, especially for someone who not only loves candles but someone who says they don't need any more candles. Actually, I'm not sure these people exist. Can you ever have too many candles? Each candle is £14, and you can buy them directly from Candle Pin Club. Let me know in the comments below what you think about a pin inside a candle, and which candle scent do you think you'd enjoy most?